North West Rubber Sportfloor® is a tough performer, made of 100-percent-recycled solid rubber flooring designed to stand up to the heavy-weight punishment in weight rooms, arenas, gyms and other high-activity recreational areas. The Classic comes in 4-feet-by-6-feet black sheets in 3/8-inch, 1/2-inch and 3/4-inch thicknesses with a flat or checker-plate pattern. Starlight comes in 4-feet-by-30-feet rolls of 3/8-inch single-ply high-density sheet flooring. Décor is available in 3/8-inch-by-35.5-inch-by-35.5-inch tiles and 10 color choices. Gerstung's latest action platform is the Jog'n ShapeTM , which is effective for individual and group exercise. The resilient and shock-absorbing platforms are constructed of a strong, flexible, structural polymer, supported by Gerstung's innovative manufactured foam Energy Blocks®. They are lightweight and just 30 inches square, making them easy to transport and stack. Lonseal offers its latest indoor sport floor innovation, the Loncourt UV. Blending the super-durability and simple "dry-erase" maintenance of a urethane finish with the wood-grain resilient sheet-vinyl design of Lonseal's Sport floor series, Loncourt UV provides a real-wood look with a glossy fitness surface that meets all NCAA requirements for bounce. It is effective for gymnasium, aerobics, weight room, dance studio, martial arts and other high-impact fitness facilities. With Loncourt UV's tough, UV-cured urethane finish, you can wipe away scuffmarks and dirt as easily as erasing marks on a whiteboard. A factory-applied urethane coat saves time during installation. The first choice for the last floor you may ever need can be Sport Floors' line of synthetic flooring, designed to perform in the most demanding multipurpose athletic spaces. These high-performance floors provide an effective surface for the competitive sports yet offer outstanding durability and ease of maintenance to accommodate the most demanding of multipurpose uses. 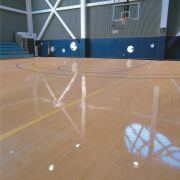 Sport Floors is the surface choice for hundreds of athletic facilities around the world. Premier Tiles are an effective application for high-traffic areas such as entryways and in front of double doors leading to recreation facilities. These anti-static tiles are made of 100-percent polypropylene with a rubber-reinforced raised diagonal pattern that resists crushing. The 18-inch square tiles are available in 1/4-inch or 7/16-inch thicknesses. Colors include blue, green, black, gray, brown, maroon and beige. Customers who are looking for a high-quality, economically priced rubber flooring that is quick and easy to install often choose Dinoflex interlocking Sport Mat flooring. The Dinoflex innovative precision-cut interlocking system is superior to many molded interlocking products and provides a seamless, uniform look without the mess of adhesive or double-sided tape. This fully reversible product can be turned all at once or as needed to renew high-wear areas. Dinoflex is known throughout the industry for its superior appearance, durability, shock absorbency, noise reduction and slip resistance. Taraflex Sports Flooring by Gerflor has a solution for your facility's top flooring needs. Athletes of all abilities get the performance and shock absorption they want with a multi-layer design that delivers comfort for longer playing time, true ball bounce and accurate pivoting. Taraflex's surface treatment increases safety and minimizes friction burns and skin-related infections. The floor's proprietary treatments repel food stains and scuff marks and prevent bacteria and mold growth, thus lowering maintenance. The floor aesthetics are easily maintained with daily water and detergent. This hardworking floor is available in several thicknesses with a durable surface. Superior Floor Company's Scissor-Loc Air Flow System's innovative design includes an exclusive under-floor humidistat and detects moisture before it is noticeable by facility personnel. Moisture that's trapped between the concrete slab and the wood floor often causes the floor to excessively expand and contract. The Automated Mechanical Air Flow device helps to prevent moisture damage to the floor system so you can beat moisture.